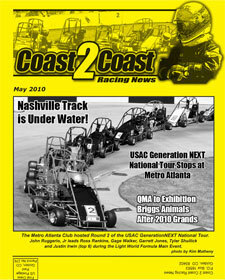 Coast 2 Coast Racing News covers Quarter Midget Racing for Kids! Quarter Midget Racing is for Kids ages 5 - 16 years old. can navigate their own racecar and learn to develop driving skills. Coast 2 Coast Racing News printed it's first copy in December of 1994. It has become the most sought after publication for Quarter Midget Racing. Each issue promotes Quarter Midget Racing and contains stories about events held across the US either at National Events, Regional Events or Local Clubs. Upcoming Races are also listed as well as advertisements giving specific details about special events. Technical Articles are submitted to give handler's tips and regular columnists such as Doug Schlosser (Vintage Quarter Midgets) submit stories for our readers to enjoy. Now that the United States Auto Club (USAC) has decided to form the .25 (pronounced Point Two-Five) Racing Series, there will be more events to cover and more drivers to write about. We are currently NOT taking paid subscriptions at this time. If you would like a sample copy of the publication, please send an email here. Click the image to read a few pages. The file is quite large so it may take some time to download!